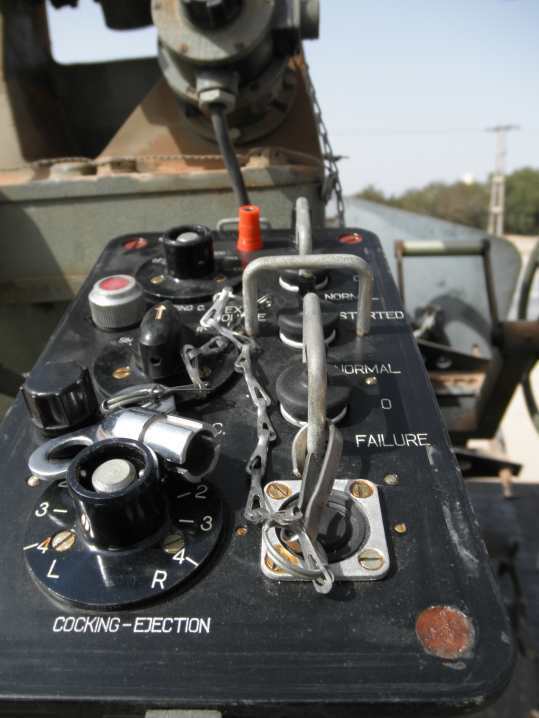 A post on the Defence Talk forums by Abbas Ahmed, from Zenad Magazine in Misrata, featured a few curious photos of an unidentified AA system. 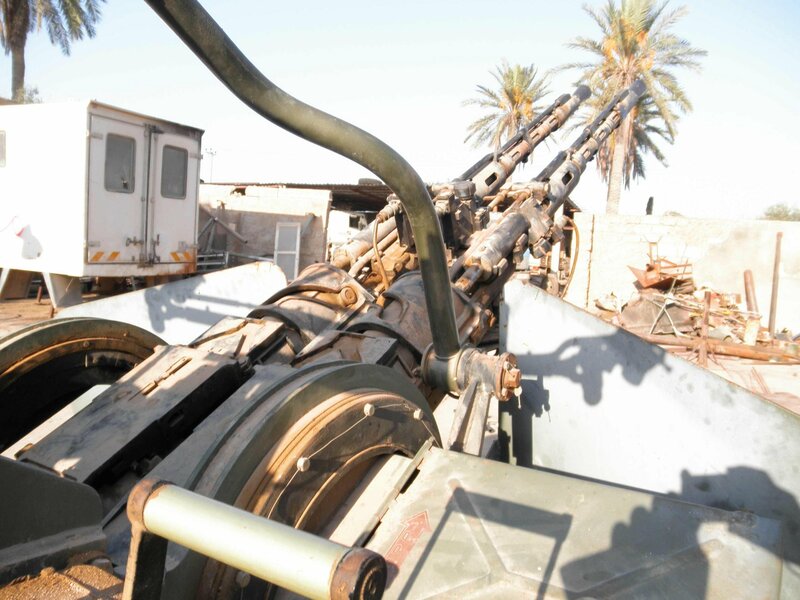 At first glance, it appears to look quite similar to a Russian ZU-23-2 (or a foreign copy), built around the 2A14 autocannon so commonly seen throughout the world, and in Libya. Libyan rebels used one, two, three, and four-barreled combinations of 2A7/2A14 autocannons, alongside 14.5mm KPV and 12.7mm DShKM heavy machine guns, SPG-9 recoilless guns, and a variety of both standard and improvised launchers for 122mm Grad and 107mm (mostly Chinese and North Korean) surface-to-surface rockets, 68mm SNEB air-to-surface rockets, and S-5, S-8, and S-13 air-to-surface rockets. It is, however, something more unusual. The AA system in question is actually a Romanian Model 80 (AKA Md. 80) towed twin-barrel AA gun, based around a pair of A436 revolver cannons, themselves derived from the Soviet-era Russian Navy NN-30 revolver cannon (these are most typically seen in the Russian AK-230 naval cannon). Unlike autocannons, revolver cannons feature a cylinder with multiple chambers in order to speed up the loading, firing, and ejecting process. The NN-30 is chambered for the 30x210B 30mm round, which can be seen below. As best I can determine, the rounds shown are HE-T (High-Explosive Tracer) rounds designated UOR-83R, using 360g projectiles containing approximately 30g of A-IX-2 high explosive. 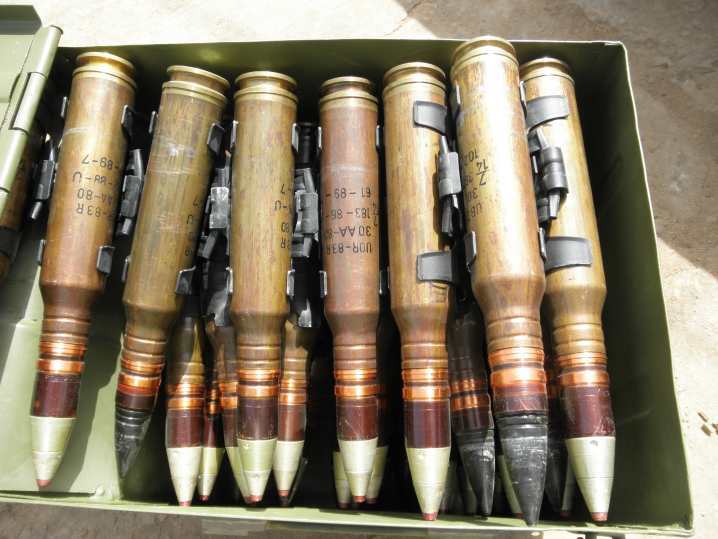 This is Romanian-manufactured ammunition, produced by ROMARM S.A., Romania’s state-owned armaments company. 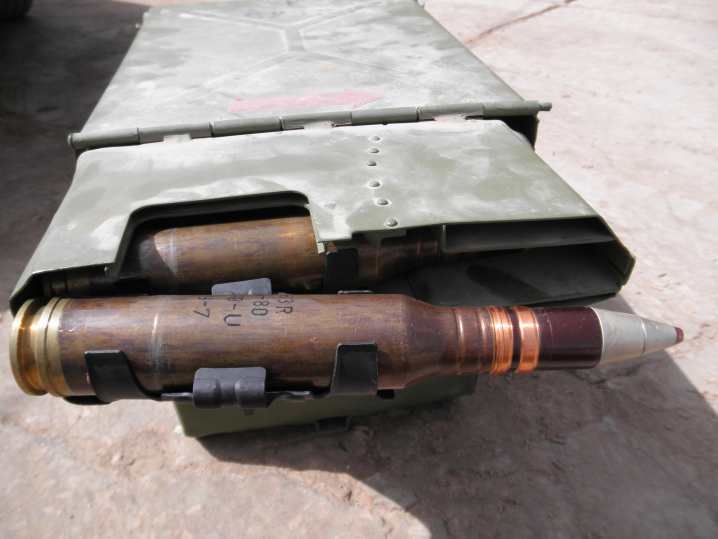 Similar ammunition is shown on their website, and 30x210B rounds are still purchased by the Romanian military for their M80 systems. 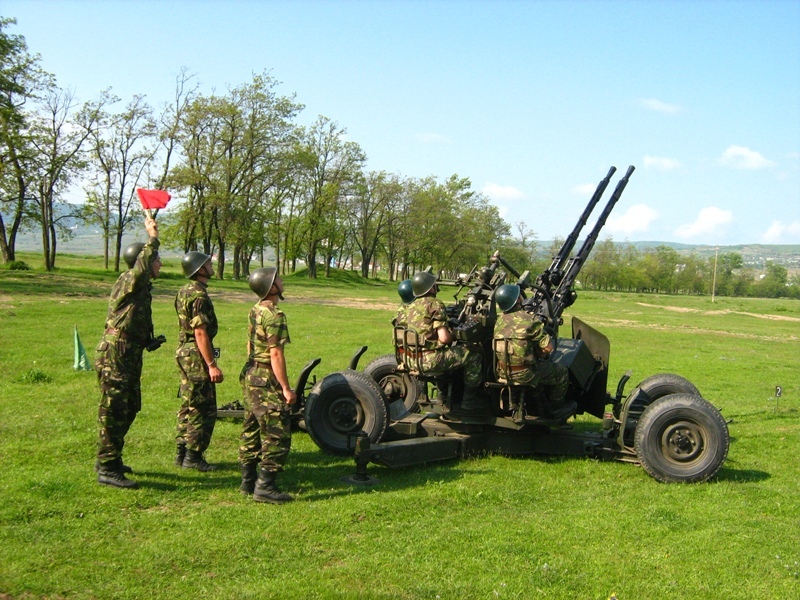 The Model 80 is the only recorded land mounting for the A436/NN-30 cannon, and is relatively uncommon outside of Romania, where it is still used by the armed forces (see photo below). How one came to be in Libya, however, is another question entirely. SIPRI notes that “AA guns” were exported in 1987 from Romania to Liberia, though it makes no mention of which systems in particular. However, there are a few clues to support the Liberia theory. Firstly, as mentioned on DefenceTalk by member kato, the Model 80 was the only AA gun in use in Romania at the time. It is still in use in Romania today, however it has since been supplemented by at least 72 Oerlikon GDF-003 2x35mm AA guns. 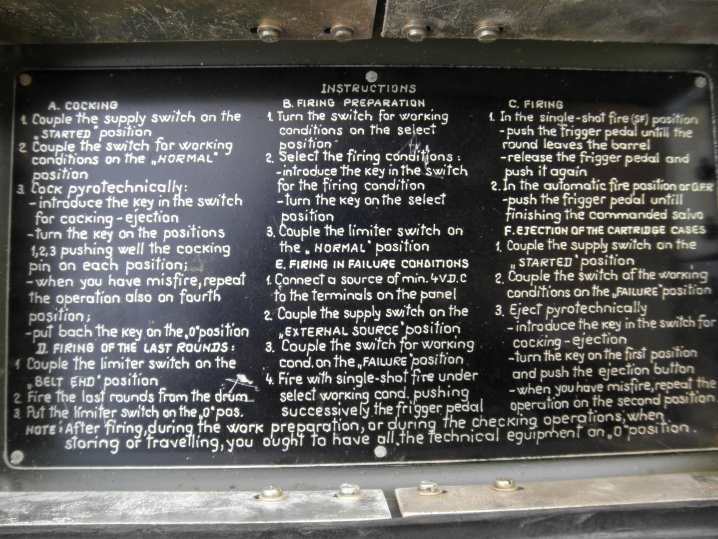 The English-language instructions (see photo below), also lend weight to the idea this weapon may have originally been exported to Liberia. 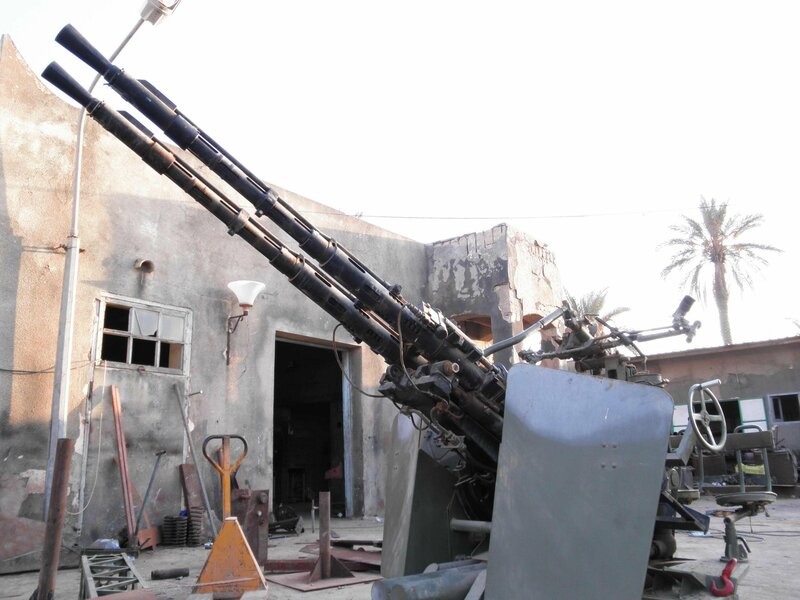 Libya continues to surprise and enthrall me with the sheer variety of weapons systems that are cropping up. Libyan photos courtesy of Abbas Ahmed (Zenad Magazine). First Romanian Army photo (grass) courtesy of 15th Mechanized Brigade “Podu Înalt“. Photo shows the 635th Air Defense Battalion “Precista“. It seems their credo is something along the lines of “The antiaircraft cannons should not stop firing until the last serviceman’s heart has stopped beating”. That’s fairly badass. 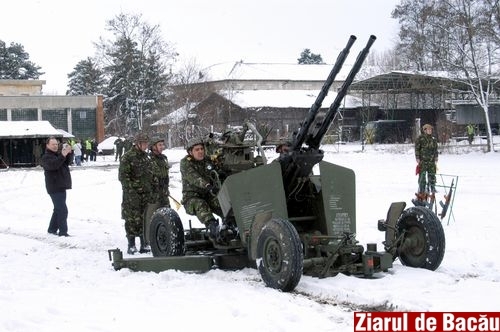 Second Romanian Army photo (snow) is taken from this page, by Ziarul de Bacău. Thanks to users twinblade of MP.net forums, and kato of DefenceTalk forums. Very interesting topic, thanks for posting. Do the Liberians still use the Romanian exported guns? I have no idea. SIPRI only lists ‘AA guns’, not quantity. It’s possible that they were all on-sold to Libya, that they were sold to another state, that they’re sittign around rusting in Liberia, or that they’re still in use. I’d love to hear from anyone who has more info. Romania sold a lot of arms to Libya back in the 80s. This delivery has nothing to do with Liberia. It was sold directly to Libya. There are a lot of arms deals of Communist Romania that SIPRI doesn’t mention. It was going to be delivered to Mauritania in 1990, but I doubt it was delivered after the Romanian Revolution in 1989. Romania also sold to Libya 14.5mm ZU-2 (licensed built ZPU-2) and probably MR-4 (similar to ZPU-4, but with only 2 wheels instead of 4). I don’t know if the cannons are of Chinese origin, but I can say that there’s a patent for the A436 in Romania. The patent belongs to Institute 111, the army’s research center. They are still used by a number of Romanian infantry AA battalions. The AA battalions of the mechanized and armoured units use Gepard and Oerlikon. The A436 can be integrated with the Skyguard/Gun Star Night of the Oerlikon GDF-003. I wrote the article based on what little info is out there (even in Romanian sources). Thanks for the comment – certainly some interesting stuff you’ve noted there! I’d love to see more documentation on the export to Libya, and potential export to Mauritania. That link re: Norinco is a little deceptive if you don’t read the text carefully and in its entirety; the A436 cannons are definitely Romanian-developed, and based off the Soviet-era Russian NN-30. The link just happened to be talking about Chinese-manufactured ammunition. I’ve sent you an email with some questions.